There are those moments that resonate with your for days and weeks and months. They remind you that the most beautiful things in life can’t be seen, but felt. What makes this wedding really incredible to me was exactly that. Ever since that special day, I could’t stop thinking about the many ways that this wedding would be really inspiring to all those soon-to-be brides out there. But first, let’s start with the idyllic setting. This wedding day begins in a cute and quaint little place called The Swan Inn, in Swinbrook, near Burford. It takes place in the picturesque quintessential English cottage countryside, known as The Cotswolds, in the UK. Once upon a time, there was a tiny cottage house called the Swinbrook House that sits in the middle of the Cotswolds countryside. It was the home of a family known as The Mitfords. There were 7 children, most of whom went on to become well known British authors. Today, just down the road from their cottage house, is The Swan Inn pub, which is owned by The Mitfords. If you visit the pub, you will get a chance to know them a little from the photography decorated on the walls to reflect glimpses into the family’s life story. This venue was also filmed as the setting for a romantic scene on the British-American television series called Downton Abbey. With the exception of a few other cottages and a family farm nearby, nothing can be seen for miles around but glorious fields of green grass, tall bushy trees, budding pastel flowers, and the expansive blue sky. 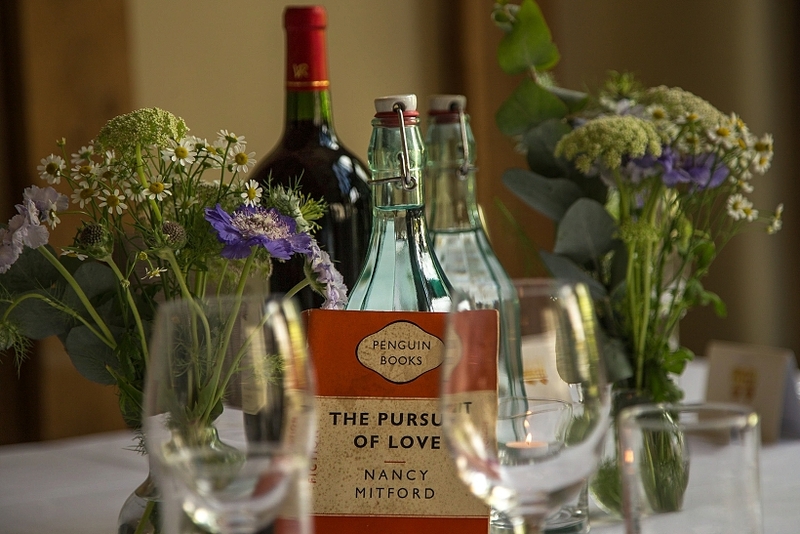 It truly feels like a destination wedding here, even for residences of the UK. Aside from this very special setting with a little bit of English family history, there were so many countless heart warming moments throughout this wedding day that made me want to scream out loud, “I wish every wedding could be like this one!”. I arrived early and found Catherine in the garden, at the back of the pub. She was sitting at a patio table with two of her bridesmaids sitting by her side. The three of them quietly putting the last minute details of the decor together. “Today’s the day!” I shouted excitedly. “How are you?,” I asked. And I don’t just mean that in a casual every day conversation. “I mean, really, how are you?”. I asked Catherine again, straight up. It’s her wedding day! A few hours from now, she will be walking down that aisle. I wanted to see her state and see how she was feeling. And if there was anything I could advise, being once a bride myself. And she was. You could tell from her face, her body language, she was so chill. She was possibly the most relaxed bride I had ever seen! “I am just so proud of you.”, I told her. Really. That is not an easy attitude to attain on such an important day, that you won’t be repeating. It’s not about being positive when everything is perfect. It’s about being positive knowing that things might not be. During the ceremony, the all important “ring moment” was about to happen. I had about a split-second to take one single shot of the rings before I watched a scene unfold in what seemed like The-Matrix-type-of-slow-motion. I watched both wedding rings rolling around the celebrant’s textbook, dropping ever so elegantly as rings could, then rolling on the ground into the surrounding shrubs and disappearing out of sight. I could sense everyone’s eyes in bewilderment and holding their breathe, but I was too busy scanning the grounds for the rings. Catherine surprisingly had her eye glued on the rings the entire time and knew precisely where they landed and went straight to the exact spot they had landed to retrieve them. I was astonished at her precision of their whereabouts. Everyone bursted out laughing. If that wasn’t enough entertainment, a few seconds later, to add more excitement to the plot, when she was just about to put the ring on Paul’s finger, she dropped the ring. AGAIN! Everyone burst into another uproar. “This was all planned”, she replied wryly. What a joker! See that? On your wedding day, when things don’t go perfectly, you laugh! Because it’s OKAY when things don’t go perfectly. 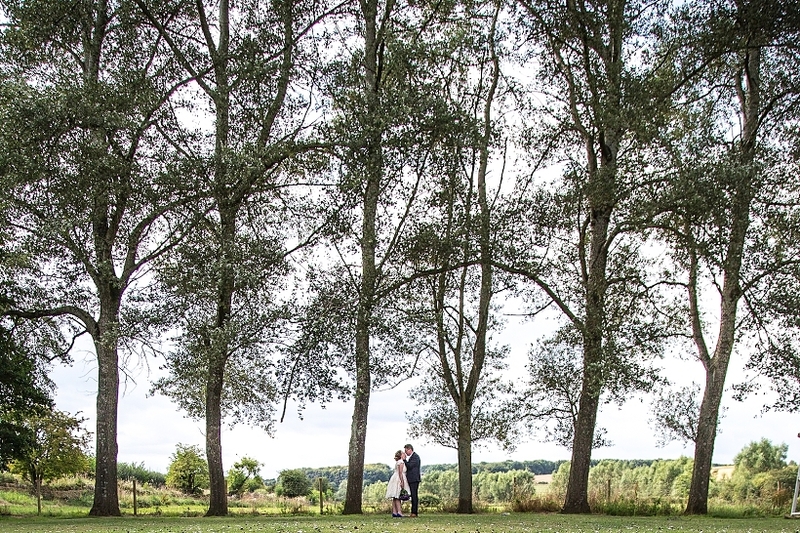 After the ceremony, the couple quietly slipped away on their own for some private alone time. I knew this in advance and initially wanted to leave them alone. It wasn’t part of my plan, but when I accidentally noticed them leaving, I spontaneously decided to stalk them. This is probably my favourite type of photography; ninja-style. I wasn’t sure they would want me to. I wasn’t sure if they would be upset. But I made the executive decision to do so, because I saw some amazing moments happening on the spot which I knew they would absolutely love! So discretely, (or so I thought), I followed them, crouching and lurking and hiding behind shrubs and buildings. Much later on, when I was alone with them for the wedding portraits, I told them I was stalking them. To which they replied, “WE SAW YOU!!!”. They explained that the stalking made them laugh and that it was actually helpful because it kept them from being too emotional. See that? A little stalking, when done with positive intentions, can be a very good thing! I loved that they trusted me and were perfectly happy with whatever I was doing. If you ask me, I think the most memorable moments are the unexpected moments. When I finally left Catherine and Paul for some moments of quiet alone time to themselves, I snuck off to mingle with their guests and get to know them a bit. It’s rare to see so many people come from around the world, travelling from all parts of the globe to a small wedding in a small village in the middle of what seems like the middle of nowhere. It is expensive! So to see half of their guests come from far and wide, from Peru, China, Australia, Canada, the United States, and all across the UK to a wedding the size of about 70, says a lot about the quality of the relationships of this lovely couple. I was really allured by how the couple have maintained their long-distance relationships. One of the key highlights of every wedding shoot for me personally, is getting to know the couple’s family and friends. I cherish those moments. I find when I spend time to get to know them, they open up, and often surprise me, and the couple, with a side to themselves that they don’t usually reveal. Throughout the 13.5 hour day, what kept me pumped was the moment after moment after moment of genuine concern and support from Catherine and Paul’s family and friends. 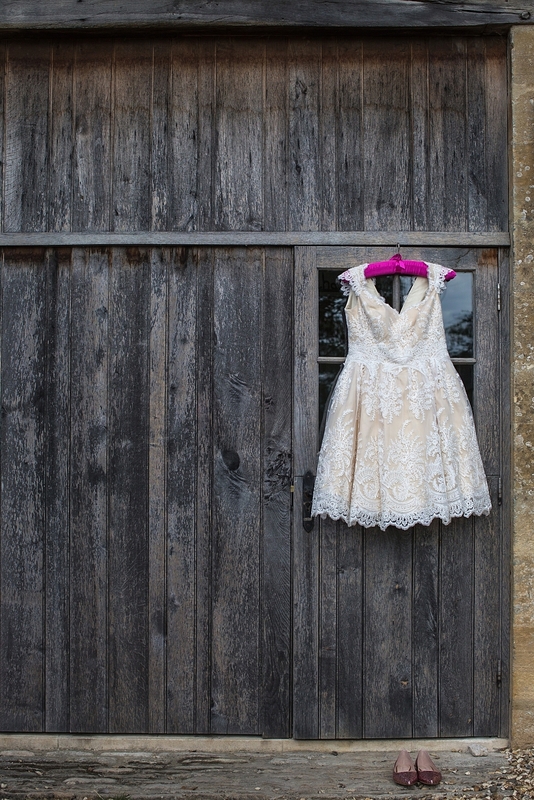 At one point, I was struggling to get Catherine’s dress hung on one of the lovely wooden stable doors that was too high for a 5 footer to reach alone. Her mum and aunts and uncles noticed and rushed over to assist. There were 4 or 5 of us, standing on a footstool, trying to hang one dress. We looked utterly ridiculous. “How many people does it take to hang a wedding dress?”, I blurted out loud, laughing. They all burst into fits and giggles. I have to give a big thanks and a monstrous virtual bear hug to Catherine and Paul’s wedding party: Tania, Ruth, Victoria, Woodsy, Dave, David, Richard. They kept approaching me, asking me if I needed anything, or if they could help me with anything. And if I did, they took my instructions super seriously, putting so much thought and effort and detail into delivering it. I was in complete awe of their determination and dedication. The rest of their family and friends constantly approached me to ask if I had anything to eat. If I was tired. If I needed anything. Their efforts and concern for my well-being was really touching. Really really really touching. That they cared. Even though they didn’t even know me. “Catherine and Paul are so lucky to have these wonderful souls in their lives!”, I thought to myself, smiling. To add to the loving rapport, there were endless moments of support and cooperation from the staff at The Swan Inn. Daniel and Anca and Alex and their entire team at the venue were exceptional. They asked several times all throughout the day if I needed a drink or needed anything at all, and they took care of it immediately. When they spotted me leaving at the end of the night, they gave me a hug before I left! I couldn’t believe it! I simply melted! What made this day remarkable and absolutely perfect? The people. Everyone from the venue, to the vendors, to the family & friends, everyone was a part of something bigger. It felt as though we had all come together to create this special team project for Catherine and Paul. That everything was equally important to each of us. That we were in this, together. This level of cooperation and communal support is truly rare and incredibly precious. Finally, something that really got to me, in a feel-good kind of way. I don’t know what it is like. To have a step-parent. Or to watch my father or mother fall in love with another person. And then accept them as a huge part of my every day life. I never thought about it before, until this wedding. It is difficult for me to fathom as a grown married woman, let alone in the perspective of a child. And as I watched Dylan throughout the day, this little boy taught me a very important and powerful lesson. This is the first wedding where I have seen such importance in the step-son being included in the wedding, and the wedding photos. You could feel that it wasn’t just about getting the shots. As I watched with amazement, the love these three have for each other, I was teary-eyed. To see a little boy accept another woman in his father’s life, with complete open arms and an open heart, I was deeply inspired. Dylan is an incredible little man. I feel really privileged in meeting him and learning from him the importance of keeping an open mind and an open heart. Although, I must add, it is very easy to love Catherine. If you meet her or get to know her, you’ll understand what I mean. So you see? What makes a wedding day truly beautiful and significant is really simple. It’s the emotions, the love, the caring. Wedding Stationary: Adrian Young (bride’s dad) (who also designed the invites, place cards, and menus). Downton Abbey: The British-American drama series about the lifestyle of an aristocratic family in the early 20th Century filmed in the UK.